Offer Terms: Issued on first successful deposit & wager of min £10 on bingo. New player bonus split £20 bingo bonus (x3 wagering) & £10 side games bonus (x30 wagering). 7 day expiry. Fabulous Bingo is a stylish site based on the ‘Fabulous’ fashion magazine from The Sun on Sunday newspaper. The site Launched in 2011, and like the fashion world itself has since undergone quite a few makeovers of its own. The most recent came in January 2017, which brought higher definition graphics, and a much more elegant and cleaner look. The site now feels super chic and classy, perfect for any bingo fashionista’s out there. In 2016, the site migrated over to the popular Playtech network. This brought a much bigger variety of games, including branded rooms such as Cash Cubes and Deal or No Deal, and updates to all the existing rooms exclusive to Fabulous Bingo. The range of bingo on offer is really great and all games come in variants of 75,80 and 90-ball bingo. The exclusive Fabulous Bingo rooms are all themed around certain fashion capitals, and each offer different promotions throughout the week. There’s also BOGOF Bingo, free bingo and Bouncy Balls bingo too, so something for everyone from bingo veterans to total Newbies. The arrival of the Playtech software saw a huge improvement to the additional side games section too. There is now a huge variety of slots titles and table games, including progressive jackpot slots with massive payouts. Fabulous Bingo really encourage the social side of bingo too. There’s a great variety of chat room games and social media hubs on Facebook and Twitter, and you can often bag a bonus whilst chatting away and making new buddies. The welcome offer is really enticing too, and is a really great way for newcomers to see how “Fabulous” the site really is. The bonuses and promotions are aplenty here at Fabulous Bingo, and the welcome bonus will really kick start your whole Fabulous experience! Just click on the link at the top of this page for more information. Terms and conditions apply, and all players must be aged 18 or over. Other promotions are updates regularly but can include BOGOF tickets, special prize nights, huge jackpots and physical prizes too. There’s 1000 Chances To Win £1000, the £500k Pay Day Payout, the Game Of The Week and also Date Night Bingo. Some of the bigger rooms like Rainbow Riches and Deal or No Deal also have regular promotions huge jackpot prizes too and there’s even chances to win over on Facebook. Take part in the weekly quizzes and games for your chance to win bonuses and physical prizes. Players in the past have won spa breaks and shopping vouchers so be sure to head on over and take advantage of those offers. Fabulous Bingo now operates on the Playtech software, and the site is registered to News Group Newspapers Ltd. The company are licensed in Alderney, and are regulated by the UK Gambling Commission and Alderney Gambling Control. Since joining the Playtech network in 2016, the Bingo on offer is wide in variety and really great quality. There is a wide choice of 75,80 and 90-ball games across lots of really fun themed rooms. There are exclusive Fabulous Bingo rooms based on the fashion capitals of the world like London, Paris and New York, and each room offers it’s own unique promotions. Players will also find big branded tooms like Rainbow Riches and Bouncy Balls and these all offer massive jackpots and prizes. The selection of slots and side games at Fabulous Bingo is brilliant. Players will find a huge variety of slots and scratch cards including fantastic progressive jackpots with great payouts. Titles include Ace Ventura, Cops ‘n’ bandits, Leprechaun’s Luck and Desert Treasure, and there’s 10 scratch titles too including Beat The Bank and Big Bounty. The only down side to Fabulous Bingo is the small selection of casino games on offer. You will only find 3 games in total however this does include Blackjack, Roulette and 3 Crad Brag so there’s enough options there if it’s something you enjoy. There’s a nice variety of payment methods at Fabulous Bingo, and currency accepted is either Stirling or Euro’s. Please read all terms and wagering requirements upon registration, as details are always subject to change. Payments may take longer or shorter to process. Bingo wager is 3x bingo bonus. Casino wager is 30x slots bonus. 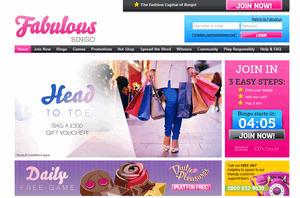 Fabulous Bingo is a chic site with a great variety of bingo and slots. As the site is so newly rennovated, it has a really modern feel with all the top games and branded rooms. The promotions are great and ever changing, so there’s always something new and exciting up for grabs. If you’re after a classy and stylish site, with excellent games, prizes and social fun, then get onboard with Fabulous Bingo.